From 22-24 October, an inspiring and varied programme of presentations, discussions and visits took place in Nicosia on the occasion of the 5th Anniversary Conference of the 7 Most Endangered programme and Capacity Building Days on Endangered Heritage within the framework of the European Year of Cultural Heritage 2018. The programme was open to participants from across Europe and brought together over 100 people from 20 countries. The conference was organised by Europa Nostra and the Centre for Visual Arts and Research (CVAR) with the support of the European Investment Bank Institute, the European Commission through its Creative Europe Programme, the Leventis Foundation, the UNDP-PFF and the Bi-communal Committee on Cultural Heritage. The conference presented an unprecedented opportunity to share the lessons learned since the launch of the 7 Most Endangered programme in 2013 and to discuss the future steps of the programme. Participants also benefited from expert knowledge in funding for heritage in danger, the management and reuse of endangered heritage and in partnership development. The conference participants were welcomed to Nicosia at a reception hosted by the Leventis Municipal Museum on the evening of 22 October. On 23 October, Sneška Quaedvlieg-Mihailović, Secretary General of Europa Nostra, moderated the opening session of the conference and expressed her thanks to those partners who helped to orchestrate such a rich programme of events. 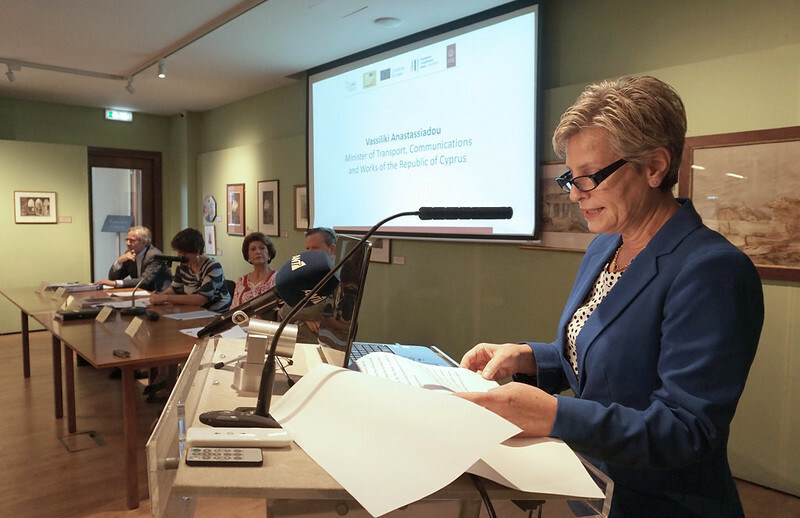 She also stressed the symbolic importance of holding this Conference in the heart of the old town Nicosia, only few steps away from the Buffer Zone. Androulla Vassiliou, Vice-President of Europa Nostra, welcomed the participants to Nicosia and underlined the benefits of the 7 Most Endangered programme to endangered heritage, especially when the many thousands of heritage monuments and sites throughout both Cyprus and Europe are considered. Androulla Vassiliou restated the wide sense of gratitude for the inclusion of the Buffer Zone of the Historic Centre of Nicosia on the first 7 Most Endangered list in 2013. Vassiliki Anastassiadou, Minister of Transport, Communications and Works of the Republic of Cyprus who is also responsible for the Department of Antiquities, wished the participants a fruitful conference and underlined the importance of active and sustained efforts in protecting heritage, especially in the contemporary world where the deliberate destruction of heritage is a serious threat. The Minister stated that she was glad that an entire session of the conference would be dedicated to the Buffer Zone of Nicosia, stating “it is my hope that concrete actions will be discussed and results will be pursued”. The Minister also expressed her support for the Berlin Call to Action: “Cultural Heritage for the Future of Europe” and signed it in front of the audience. 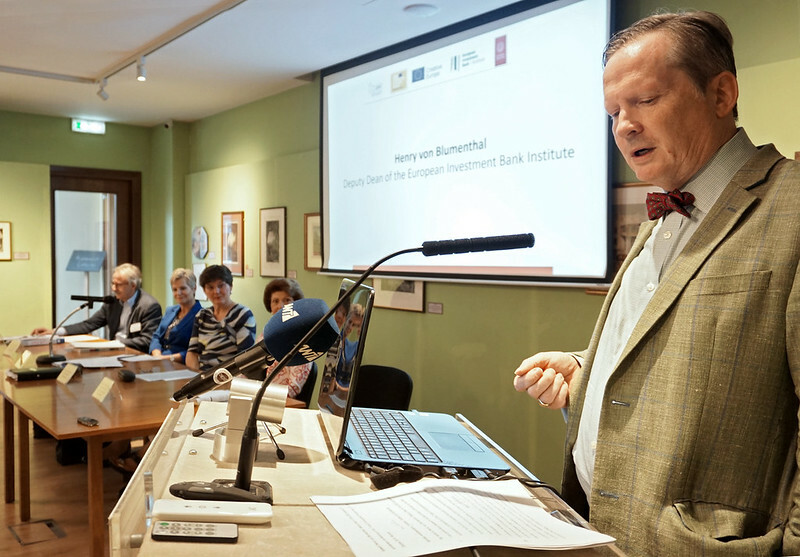 In his address, Henry von Blumenthal, Deputy Dean of the European Investment Bank Institute, emphasised the value of heritage in socio-economic terms as well as in terms of public health and underlined key areas that need to be further developed to promote the restoration of cultural heritage and support for the development of skills in culture. One is visibility, which is addressed by the 7 Most Endangered programme, and whose on-site missions and reports, according to Mr. von Blumenthal, increase “both the visibility of the cultural importance of the sites and the credibility of the proposed restoration efforts helping to ensure their survival”. Another area identified by Henry von Blumenthal is partnerships and coordination to safeguard cultural heritage and to use it as a tool for social and economic cohesion: a core element of the 7 Most Endangered programme, developed in partnership with Europa Nostra and with the support of the EU Creative Europe programme. “We, the European Investment Bank Institute, are particularly pleased with the results of our five year collaboration”, he stated. Guy Clausse, Executive Vice-President of Europa Nostra, provided an update on the progress made at the first 22 sites listed between 2013 and 2016 and drew correlations between the various factors which have led to the varying levels and speed of progress across the selected sites. The first day of the conference was also dedicated to the lessons learned from the first five years of the 7 Most Endangered programme and participants heard from experts who contributed to the missions to the sites previously listed in the 7 Most Endangered programme, as well as key players in policy, funding and partnership development. Nada Hosking, Director of Programs and Partnerships at the Global Heritage Fund, addressed the audience, underlining how essential partnerships have been to the success of several globally implemented programmes related to heritage conservation, such as the Sagalassos Training Programme in Turkey and the Collective Granaries project in Morocco. She also expressed keen willingness of the Global Heritage Fund to develop a mutually beneficial partnership with Europa Nostra. Erminia Sciacchitano, Chief Scientific Advisor of the European Year of Cultural Heritage 2018, DG Education and Culture of the European Commission, offered insight into the EU policies that are in place for (endangered) heritage and provided updates on future actions at EU level. She indicated that the future EU Action Plan for Cultural Heritage will also contribute to saving Europe’s heritage at risk. Various funding schemes, from established grants to crowdfunding opportunities were presented by speakers from diverse institutions, including Mario Aymerich, former Director at the Projects Directorate at the European Investment Bank, Sheamus Cassidy, Head of Priority Sectors Unit at the EEA / Norway Grants, Marco Pino, Policy Analyst at the DG Regional and Urban Policy of the European Commission, Myrto Hatzaki, Greek Programmes and PR Manager of the AG Leventis Foundation (Athens Office), and Kleitia Zeqo, Crowdfunding Advisor at the Technopolis Group based in Amsterdam. Three winners of the EU Prize for Cultural Heritage / Europa Nostra Awards shared their examples of best practice in saving endangered sites. Koen van Balen, Director of the Raymond Lemaire International Centre for Conservation presented the conversion of De Hoorn Brewery into a creative hub, Leuven (Belgium) as an example of successful adaptive reuse; Juan de Dios de la Hoz Martinez of Lavila Arquitectos spoke about the recovery of the Six Churches in Lorca (Spain) after serious earthquake damage; and Pavlos Chatzigrigoriou presented Hermes: Hermoupolis digital heritage management (Greece) a unique tool for crowdsourcing data about at-risk heritage. During the lunch break, a photo exhibition on the Buffer Zone of Nicosia by the young Dutch photographer Roman Robroek was opened in the presence of Her Excellency, the Ambassador of the Kingdom of the Netherlands in the Republic of Cyprus, Ms Nathalie Jaarsma. 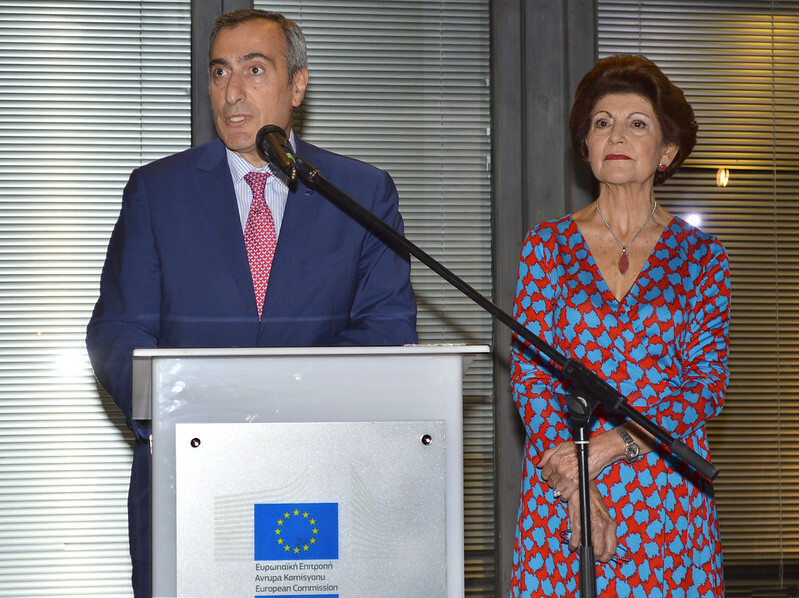 On the evening of 23 October, the participants attended the opening of the Amphora Project art exhibition which was organised on the occasion of the European Year of Cultural Heritage 2018 and under the auspices of the European Commission Representation in Cyprus and Androulla Vassiliou, Vice-President of Europa Nostra. The evening was enlivened with an excellent performance by the bi-communal Cyprus Chamber Orchestra. On the second day of the conference, particular attention was paid to the case of the Buffer Zone of the Historic Centre of Nicosia, thus giving a special focus to a country belonging to the wider region of South East Europe which has been confronted with many challenges. Many active players in the field of heritage in Nicosia shared their experiences of working towards a Master Plan for the city and especially for the area currently located in the Buffer Zone of Nicosia with others explaining their understanding of the city’s history and their vision for the future. The day was opened with a forceful and inspiring speech by Elizabeth Spehar, Special Representative of the Secretary-General and Head of Mission of the United Nations Peacekeeping Force in Cyprus (UNFICYP), and was concluded with a panel discussion with representatives of the two communities of Nicosia, Constantinos Yiorkadjis and Mehmet Harmanci, and Guy Clausse, Executive Vice-President of Europa Nostra. On this UN Day, it was agreed to send a strong appeal to the two leaders of Cyprus to give the necessary political impetus to saving the endangered historic buildings and sites located in the Buffer Zone of Nicosia, which continue to deteriorate, and to opening new crossings in the Buffer Zone to allow different communities to develop further bridges and exchanges. On the afternoon of 24 October, conference participants visited the Othello Tower and monuments restored by the Technical Committee on Cultural Heritage in Famagusta and learned more about the situation and work in this city.